While pregnancy is usually a time of happiness and celebration, it is also a time of responsibility. One of those responsibilities, which can be too-easily overlooked, is dental health during pregnancy. Dental health during pregnancy is important, however, as it affects both the mother and the child. While most normal treatment is perfectly safe during pregnancy, some procedures and medications should be avoided. The best way to make sure you get appropriate treatment for you and your child is to consult your United Smiles dentist. Maintain the health of your teeth and gums for overall health. 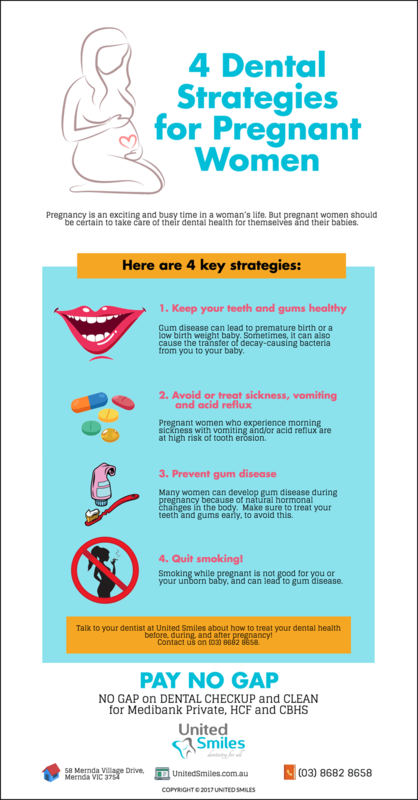 Gum disease can damage your health and that of your baby, including causing premature birth or a low birth weight baby. Healthy gums can reduce transfer of bacteria your baby, which can lead to early childhood tooth decay. Treat vomiting and acid reflux due to morning sickness. Morning sickness with vomiting and/or acid reflux can be a symptom of pregnancy. Vomiting and acid reflux can lead to enamel erosion. There are simple ways to reduce this risk. Rinse your mouth with a mouth rinse or even water, chew sugar free gum, or smear a dab of toothpaste on your teeth. Finally, wait 30 minutes before brushing if you have vomited. Put down the tobacco! Stop using all tobacco products. Tobacco products not only adversely affect pregnant women, but also their unborn children. Talk to your dentist for help on cessation treatments. United Smiles serves patients from all Melbourne areas. We are here to help our patients in pregnancy and all stages of life. Call us today on (03) 8682 8658 or book an appointment TODAY!